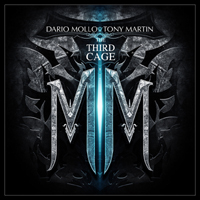 The Cage, a project consisting of ex-Black Sabbath vocalist Tony Martin and Italian guitar virtuoso Dario Mollo (Voodoo Hill) first began in 1999. The Third Cage is the third and latest musical chapter in their book. Martin-era Sabbath material can’t be overlooked. Albums such as The Eternal Idol, Headless Cross, TYR and Cross Purposes were some fine albums, although not as recognized or as revered as the Ozzy or Dio-era Sabbath. Forbidden however, was the only Sabbath album Martin didn’t like. Mollo and Martin fit well together musically and they both accentuate each others talents. Mollo’s guitar harmonies mix well with Martin’s vocal harmonies. Martin’s voice is soulful and charismatic. Mollo is a shredder and can arpeggio and sweep pick with the best of them. His technique and style is technical yet emotional. He doesn’t just show off or cram in a lot of notes, and his leads are well-thought out and emotional with tons of feeling. The Third Cage has a Sabbath/Rainbow feel to it. It’s a great metal/rock album with a great production and a hard-edged sound with modern-day techniques. The Third Cage is most definitely worth checking out, especially if you’re a fan of Martin-era Sabbath material. It’s a great endeavor by two great musicians doing what they love.